Hi, I am interested in your 1955 Chevrolet Bel Air (stock #4893-CHA) listed on Autotrader for $115,995. I'd like to get more information about this vehicle and confirm its availability. 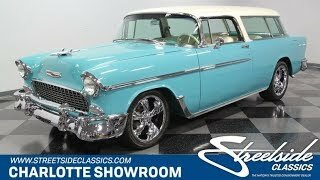 The Chevrolet Bel Air Nomad is at top of every bow tie fans wish list, but not all are created equal. After all, only when your build spared no expense would the result be something as awesome as this. And were not just talking about a beautiful body. With the modern fuel-injected V8, upgraded suspension, custom A/C interior, and much more, this is the ultimate one-of-a-kind dream machine up for grabs. If you want the ultimate level of desirability, it helps to start here. After all, the Nomad was the most expensive and rarest Bel Air model in 1955 (we already consider the convertible version to be very rare, and Chevy sold nearly seven times more than the Nomad!) So its history is secured. But this one is a king among kings. It was given a full frame-off rotisserie restoration that took four years to complete. And since theres less than 1,700 miles on this since completion, it retains the unmistakable look of an investment that rivals what other people pay for comfortable homes. You know they took the time to get everything right. The beautiful Regal Turquoise and India Ivory not only have a deep luster, but also there was a pearlescent overlay to ensure that you get even more radiance in the sunshine. Speaking of brilliance, we suspect there was as much invested in the bright work as most people do for an entire car. Thats why the wide grille is shining, the tailgate slats are so crisp, and car show spectators will use the mirror-like bumpers to check their hair. All the Nomad-specific details you love are correct from the bright trim line that wraps around the headlights, to the iconic wraparound rear glass. And the addition of LED lighting and 18-inch Foose wheels let everyone know this restoration went way beyond stock. You can win awards for the interior all on its own, and thats because nearly $30k was invested just to get the upholstery custom made in Italian leather. Everyone gets these amazingly comfortable bucket seats, even in the rear. Plus, yours power adjusts to the ideal position. This beautiful material is coordinating on the all the side panels to give it a uniform appearance that everyone loves to see at the shows. As the name suggests, the Nomads are meant to cruise the open road. So this one has great features to keep everyone comfortable, including a Kenwood AM/FM/CD stereo, cup holder center console, power windows, LED lighting, and ice-cold air conditioning. But like any good custom classic, the best treats are reserved for the driver. You get a stylish sports steering wheel mounted on an Ididit tilt column. Plus, you stay completely informed on everything thats going on with your classic thanks to the upgraded full Classic Instruments readouts that fit in the factory fan-style panel. While all you have to do is park this Nomad for the crowds to fall in love/lust with it, we also know you wont be able to resist lifting the hood. This Chevys engine bay is filled with a legendary motor, but one much younger than most people will be expecting. This is a 5.7-liter fuel-injected LS1 crate motor the V8 that ushered in the modern era of GM performance. They have done an excellent job of making this Nomad look like it had Corvette power since day one with the engine covers, intake, and much more painted to match the exterior and fender walls. The only other color in this engine bay besides the turquoise is chrome thanks to the big investment in polished components. And more than just look amazing, this crate motor was built with the best driving features. It includes a Griffin Crossflow radiator to help keep it running cool (even in traffic), a Street Performance serpentine belt system, and ceramic coated headers that feed the sweet-sounding dual exhaust. Make sure you follow the path of that rumble in the undercarriage photos. Not only does it showcase the level of color coordination and quality of this frame-off restoration, but also youll spot some terrific suspension upgrades. For example, the front end is a modern piece with Heidts components, including 2-inch drop spindles, tubular upper & lower A-arms, and adjustable coil-overs. And this is the ultimate cruiser with power steering, four-wheel disc brakes, modern performance tires, and a four-speed automatic transmission w/highway-friendly overdrive. There is a huge photo file documenting the nut-n-bolt restoration. This amazing classic represents over $180k in investments, so you know we dont have the room to tell you about all the upgrades here. But give us a call, and well be happy to go over the full list that makes this Nomad the ultimate restomod dream machine. Call now!